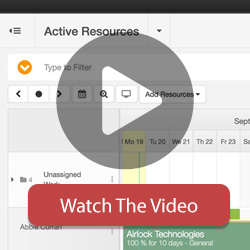 At the top right menu above your scheduler is located a toolbar with several options. Between the tool options is also a “Print/Export” icon, which is located to the left from the “Search” tool. Clicking that “Print” icon will give you three options: Print, Download Image or Export. The print function allows you to print (obviously) but you can also use your print dialog box to create PDF’s of the print page. Clicking “Print” will redirect you to a modal window where the printer can be specified. 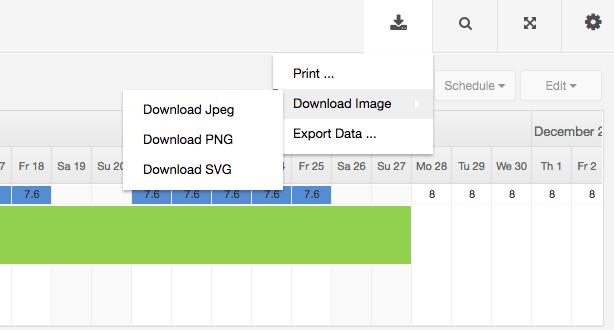 Clicking “Download Image” will download the selected data from Scheduler to your computer as an image in a Jpeg, PNG or SVG format. JPEG is not the optimal export format. The nature of the exported image (rectangular shapes, blocks of uniform colors) makes it work much better with PNG. The same image exported as PNG usually has about 50% smaller size and better image quality (PNG uses lossless compression). SVG is a vector format – the exported image can be resized as needed without the loss of image quality.